Acknowledged author Teri Moser Woo RN PhD CPNP-PC FAANP wrote Pharmacotherapeutics for Advanced Practice Nurse Prescribers comprising 1520 pages back in 2015. Textbook and etextbook are published under ISBN 0803638272 and 9780803638273. 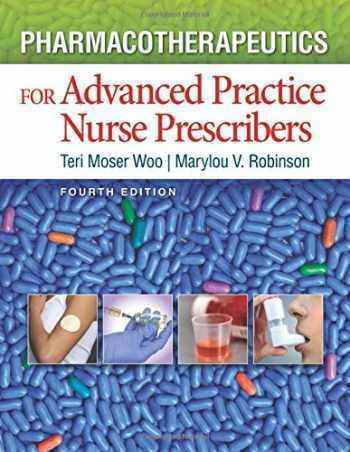 Since then Pharmacotherapeutics for Advanced Practice Nurse Prescribers textbook received total rating of 4 stars and was available to sell back to BooksRun online for the top buyback price of $47.48 or rent at the marketplace. The only text that meets all AACN/NONPF criteria. Clinical Pearls, insights from expert practitioners on how to increase patient compliance, analyze potential drug interactions, and improve treatment selection reasoning. Case Studies illustrating the paradigm drug and select common uses for each class of drugs. Tips on how to evaluate new drugs from the literature provided by drug representatives. Discussions of the application of advanced pharmacotherapeutics to the real world of clinical practice. Coverage of pathophysiology as it relates to the use of specific drugs. Easy-to-understand illustrations of drug physiology and how drugs work in the body. Tables that detail commonly used drugs, pharmacokinetics, drug/food interactions, dosage schedules, and available dosage forms. On the Horizon boxes highlighting potentially useful drugs currently in clinical trials.